Octogenarian couple Georges and Anne live a culturally rich and rewarding life, but when Anne suffers a series of strokes and begins to exhibit the first signs of dementia, their life-long love faces its most challenging test. The latest film from Michael Haneke, director of such diverse but confrontational works as Funny Games, The Piano Teacher and The White Ribbon, is an emotionally devastating story of the destructive nature of ageing and power of love, told with warmth and humanity and unflinching honesty. Winner of the Palme D'Or at this year's Cannes Film Festival, the film boasts two astonishing central performances from veteran actors Jean-Louis Trintignant and Emmanuelle Riva, and in a telling support role, Isabelle Huppert as the couple's daughter Eva. With reviews off the scale and little sign of the divisions of opinion that the director's films usually prompt, Amour may prove to be Haneke's most critically acclaimed film yet. 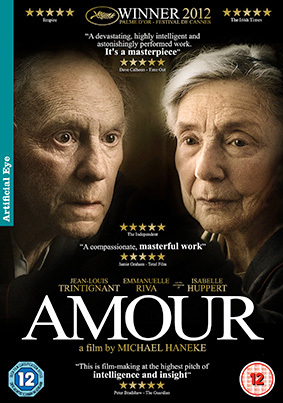 Amour will be released on UK Blu-ray and DVD on 18th March 2013 by Artificial Eye at the RRP of £19.99 for the Blu-ray and £15.99 for the DVD.